The Little Black Drug Book is a guidebook for all things drug-related for d20 Modern. 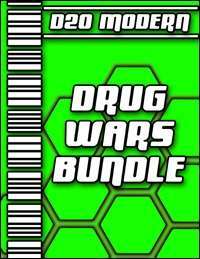 From illegal narcotics to experimental super-soldier serums and zombie-creating nerve gas, if you can smoke it, snort it, or inject it, you'll find it in this book. You'll also find new feats, equipment, and advanced classes for characters who manufacture and deal in drugs. While all of this material can be ported over to any modern d20 campaign, it has been designed with Haven: City of Violence d20 Modern in mind, and as such it might be too gritty or lethal for more general d20 games.